Lorna Francis enjoys her quiet life at Uniting AgeWell’s Costa Court serviced apartments, where residents live independently with extra supports to make life easy. 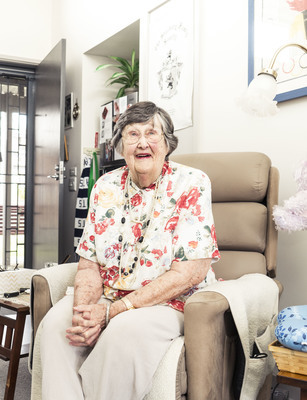 It was 2016 when she packed up her favourite furniture and pot plants and moved from the five-bedroom home she built with her late-husband almost 65 years earlier, into her apartment at Costa Court. The now 97-year-old, who has experienced some health problems, was increasingly relying on her children to continue living at home and wanted to ease the burden on them. Lorna now lives in a comfortable one-bedroom unit and her family have peace of mind knowing she no longer has to worry about maintaining the large family home. In fact, all her main meals and cleaning are taken care of. “We’ve got two chefs here and we get lunch and dinner cooked fresh for us every day,” she said. Should Lorna choose to cook her own dinner, or host visitors of her own, she has the freedom to do that. Each of the 10 one and two bedroom apartments at Costa Court has a full kitchen. While there are opportunities to be social in the communal lounge, particularly over main meals, Lorna said quiet time was a blessing. “After lunch, I might go back to my apartment and read the paper or have a nap until dinner and I have my privacy – no one interferes,” she said. Costa Court Serviced Apartments Uniting AgeWell’s Costa Court Serviced Apartments are located at 48 Settlement Road, Belmont – adjacent to Kalkee Community, Murray aged care residence. The village is hosting an Open Day with Devonshire Tea on Saturday, 2 February from 2pm. For more information, call 5243 9566.